The University of Notre Dame will host a career fair for positions within its service industries from 10 a.m. to 2 p.m. Saturday (June 17) at the Kroc Center, 900 W. Western Ave., South Bend. Candidates should present themselves in a professional manner for interviews, and will be informed of hiring decisions immediately. Applications are available online at https://jobs.nd.edu/postings/8853. Interested candidates are encouraged to bring a completed and printed application to the career fair to save time. Computers will be available on-site for applicant use. 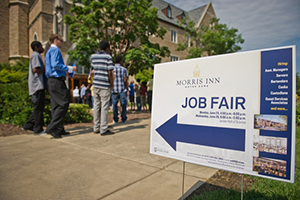 Positions are available in Notre Dame Campus Dining, the Morris Inn and St. Michael’s Laundry, Building Services, Notre Dame Security Police, Notre Dame Fire Department, VenueND and Hesburgh Libraries. Employment benefits for University employees include paid time off, eligibility to participate in retirement plans, use of some athletics facilities, discounts at some on-campus and off-campus facilities and discounts on cable and cellular services. Originally published by Sue Lister at news.nd.edu on June 14, 2017.